The Monk Eumenes from the time of his youth was noted for his virtuous life. He strove to serve the One God and therefore he shunned worldly temptations. Concerned about salvation of soul, he distributed all his substance to the poor. 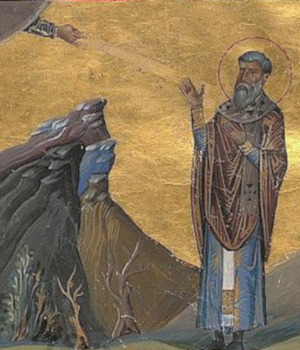 By the blessing of God the Monk Eumenes was chosen and elevated to the dignity of bishop of the Gortyna Church on the Island of Crete. The saint like a compassionate father comforted his flock in their sorrows, and cared for the orphaned and indigent. He prayers were so strong before God, that once during the time of drought he called forth abundant rain upon the earth. Saint Eumenes wisely and zealously defended the orthodox faith against the then arising Monophysite heresy. For his opposition to the heresy the saint was banished to the Thebaid, where he died in the seventh century. His body was then transferred and buried in Gortyna.